Behold, PC Gamer Republic! 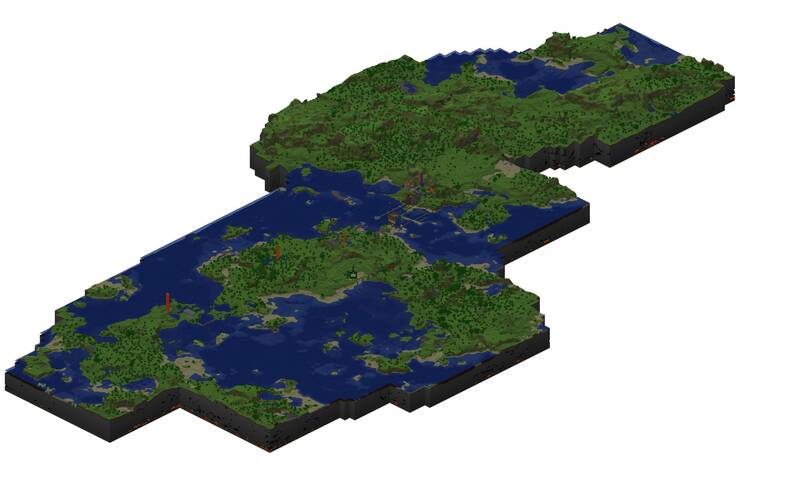 PC Gamer's Minecraft paradise, and your next forced labor destination. Gaze upon your new home: a rolling plain of petting zoos and unaccommodating mining camps, interrupted only by the pristine seas that we haven't figured out how to exploit yet. We're opening PC Gamer Republic to the public today. Reach it at 207.210.252.12:25566. We've already been tinkering around in it for a few days, inviting our pals from Maximum PC and @Gamer to cobble up some initial stuff. But now that it's public, here's our pitch: build fantastic stuff on our server, send us a photo (or YouTube clip) to letters@pcgamer.com, and we'll feature it on the website in our regular (weekly, maybe) updates. The PC Gamer Resource Exploitation Monopoly does not tolerate destruction of projects. In other words: we'd like to maintain this as an open, collaborative server--if you destroy stuff, you'll be banned, publicly humiliated, and marooned to the new hell-world that Notch is cooking up. Capable pit-enthusiast Daq has established a 32x32 strip mine east of our spawn point, just beyond the lake that surrounds @Gamer Manor. With only three or four of us clearing cobblestone at it over the weekend (including Madalynn, Daq's girlfriend), we've reached iron ore depth, and have discovered an interconnected group of caves and dungeons beneath. Above ground, there's plenty of storage to house (and smelt) the fruits of the earth. Coal, mostly. Once we've dug all the way to bedrock, we'll likely fill it with water. Or TNT. Who knows! If you love monotony, lend us your pick. While Daq and company were toiling in the earth, I fashioned a lavish bath suite above the mine so I could monitor their progress from on high. A glass diving board also overlooks the hole we've carved below. The largest standing structure currently in The Republic, @Gamer Manor is still in its foundational stage, a well-organized pile of dirt that Andy intends to transform into a beacon for the most coupon-filled and shiny magazine our company currently produces. This ode to minimalism, capably captured by Maximum PC senior associate editor Nathan Edwards , mirrors the design of the 1951 Mies van der Rohe home that still rests in Plano, IL. Nathan did van der Rohe one better: he made the house hover. Farnsworth is currently the prominent structure in the west. Visit its library. Build as you please without impeding the work of others. Don't forget to clue us into what you've made by sending us an explanation and screenshot to letters@pcgamer.com--we may even issue specific challenges in the future for fabulous prizes. Check our community forums later this week, too. We'll have a Minecraft subsection established there where we can collaborate. Go, my ants, go! Check the next page for additional views of our server as it stands.